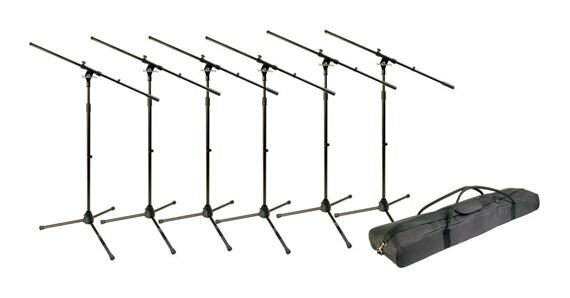 Shop World Tour MSP600 Microphone Stand 6 Pack With Bag from AMS with 0% Interest Payment Plans and Free Shipping. Packed with pro features and protected by a long-lasting black finish, the lightweight MSP6000 is a great choice for almost any application. A durable tripod mic stand and boom combination where the legs fold down for the most compact storage. Setup height is adjustable. The boom boasts hybrid sheet metal and high-impact plastic leg housing making it unbreakable. A removable boom arm and its ability to fold flat make this stand a must for every member of the band. Also features a cast steel mid-point clutch for easy adjustments. In addition, the folding legs feature plastic endcaps for durability and reduced floor vibration. Great stands for the price. Great stands for the price. Excellent build quality for the cost. If your looking for an inexpensive way to replace your old stands or start a band, this is it. There are better stands out there but not for the money. Good deal and the bag is a plus. Stands do a great job of getting my mics where they need to be, all around my drum set. Not Super Heavy-Duty, but for the price and mainly studio application, they work well. These are not pro touring stands so dont expect to throw them around a case and have them take abuse. I use these at a small xlub for live bands and they work great. Have had no issues with them as of yet. They adjust well and dont tip. All in all great for staionary or studio studf. All in all great atands that hold mics and do what they are suppose to. Not to mention ams has the best orice for them hamds down. The quality is there as well as a bag to carry! Needed a few new stands for rehearsal and gigs. Great stands, solid construction, nice bag to carry all six.